One of Iowa's best kept secrets may be Shimek State Forest nestled along the Des Moines River in the far southeast tip of the state. Nearly 9,000 acres of oak and hickory hills and valleys, with more than 1,000 acres of pine plantations interspersed, can afford the visitor a look at a multipurpose woodland used for timber production, wildlife management and recreational opportunities. The forest is named after the late Dr. Bohumil Shimek, an Iowa naturalist and former University of Iowa professor. 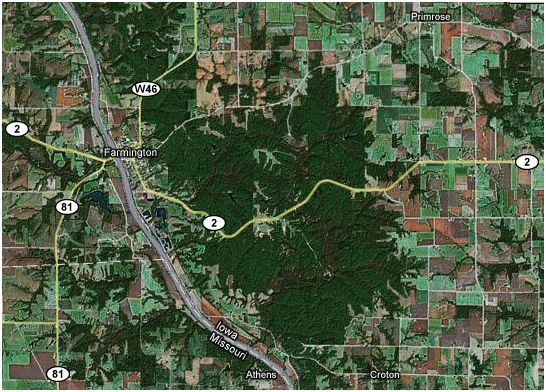 During the 1930s, Shimek convinced the state to acquire vanishing forestland in Lee and Van Buren counties along with abandoned farms, which were depleted from more than a century of farming. Then referred to as the “ Lee and Van Buren State Forest,” work began to reforest the open areas. The Civilian Conservation Corps planted many acres of hardwood and softwood stands. These northern and southern species were trial demonstrations to determine adaptability to Iowa’s climate. The pines that predominate today, Eastern white pine and red pine, have shown that the northern species have fared the best. Forestry demonstrations within Shimek include various plantings, thinnings and harvests with the emphasis on sustained yield management for the dominant white and red oaks, used for veneer and sawlogs. Through private contractors, timberstand improvement or thinnings have been done for pulpwood, firewood and Shiitake mushroom logs. During the last two years, experiments through demonstration thinnings have been conducted to produce “Iowa-grown” softwood products from the many acres of pines. Possible uses for landscape timbers, other products, which are currently “imported” to Iowa, are being marketed. The establishment of a new market for forestry products with the wholesale industry an be linked to the cooperation of the Iowa Wood Industries Association. This will have significant implications for expansion of the wood industry in Iowa and insure management production on more forested acres. Because Shimek, as well as other state forests, are considered public hunting areas, hunters may find excellent wild turkey and white-tailed deer hunting in season. Resident and non-resident hunters can also enjoy squirrel, rabbit, quail and many other species of small game in season. Fishing any time of the year in one of the many small lakes in the area could yield a limit of largemouth bass, channel catfish or several types of panfish. Only electric trolling motors are allowed on the ponds and small lakes. The cool sandy woodlands also provide opportunities for primitive camping at one of four campgrounds at $4 per unit per night. Two of these, located in the Lick Creek Unit, are designed for use by the equestrian camper, with more than 20 trails available. Scenic hiking trails honeycomb the remaining Croton, Donnellson, Farmington and Keosauqua units. Picnicking, nature study, fishing, hunting, cross-country skiing, snowmobiling, bicycling, mushroom hunting, hiking and horseback riding are all available at Shimek. Forestry field days that address forestry issues for private landowners are held each September. Spring and fall nature walks and outdoor days for students attract more than 2,000 individuals annually. 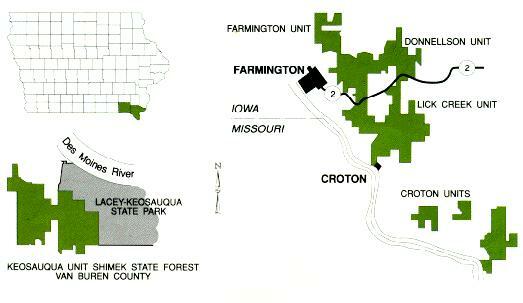 For information on these events, contact the area forester at Shimek State Forest, Farmington, Iowa 52626, (319) 878-3811.